I am reminded of the song sang by the Byrds, “Turn, Turn, Turn” which was their way of saying the same thing…to everything there is a season! 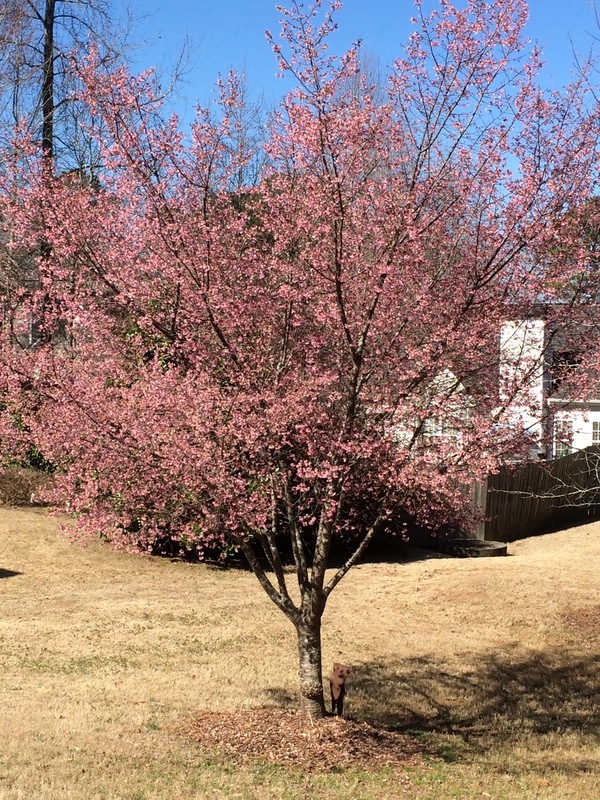 Spring is on its way here in Georgia and its always beautiful! I love it when the trees bloom! The Dogwood trees will be blooming soon and I will be reminded of my mother, who always loved the Dogwoods and Spring in Georgia. She is with the Lord now which makes these memories even more special to me. I felt I was moved to take this is a picture of a cherry tree in our yard in full bloom. I wish these blooms would grow into fruit, but this tree is just for looks, but while in full bloom it is beautiful! However, just as fast as the blooms were there, they are now gone. There are some on the tree still but most have fallen to the ground, and to be honest, the beauty is almost all passed. This is just an example of how quickly seasons come and go and a reminder to live in the here and now and enjoy God and all His provisions. This is not to say we should not look back or should not plan ahead. The thing I am learning is to look back less, and to look forward more! Even though, from a seasonal point of view, I prefer the Winter’s and the Holidays of that Season more than the heat and humidity of Summer in Georgia. Ugh!! Me and my family are in a new season of life and ministry. So much has changed in our lives. The people that surround us are different, the community we live in is different, the jobs we have are different…to everything there is a season! Our new season is just like the Cherry Tree, bright and beautiful, not just because of the new things, but because our Lord is Faithful and Good. The new Season of Spring and the new season’s we find ourselves in life have this one constant…the Lord is with us! He provides all we need, even the simple beauty of a tree in bloom to remind us of His Presence and Beauty, His Faithfulness and Goodness, and A New Season. And, if the season we are experiencing is, by our determination, not so good, then it too, will soon pass, because…to everything there is a season! Thanks to our LORD for this Hope!! How to handle opposition from others! I am sure you have experienced opposition at some point in your journey from others. Either a boss, or coworker, or a friend (or someone you thought was your friend), a family member or sometimes it just seems like the whole world is against you. Well, you could just get angry and flick everybody off and say, “who needs em?”, but that really doesn’t help because that just leads to more pain in you. Bitterness develops and that is a hard root to pull up entirely. David said that deceitful mouths were opened against him. Ever feel like people are telling lies about you? David said people were speaking against him. Ever feel like people are talking about you and what they are saying is not good? David said people were surrounding him with words of hate. Ever feel like people are hatin on you? David said people were attacking him without cause. Ever feel like you wondered what it was you did? David said that people were accusing him even though all he did was love them. Ever feel like you can’t ever do enough good for folks? What are you to do? What did David do? In other words, David looked to the Lord. Jesus did the same thing. They both model for us how we should handle opposition. Look to the Lord, cry out to the one who judges righteously. David then praised the Lord! “with my mouth I will give great thanks to the Lord, I will praise him in the midst of the throng” We too must be careful to praise the Lord and give not just thanks, but GREAT thanks! After all, its for His name’s sake!! Hard to do I know and hard to conceive how this helps us deal with opposition, but we must believe the Lord see’s, hear’s, and will act in righteous judgement on our behalf, not out of pride for ourselves, but for HIS NAME’S SAKE! !